After 30 years of bold action, historic achievements, and sometimes discouraging setbacks, Rotary and its partners in the Global Polio Eradication Initiative (GPEI) have nearly brought polio to an end. 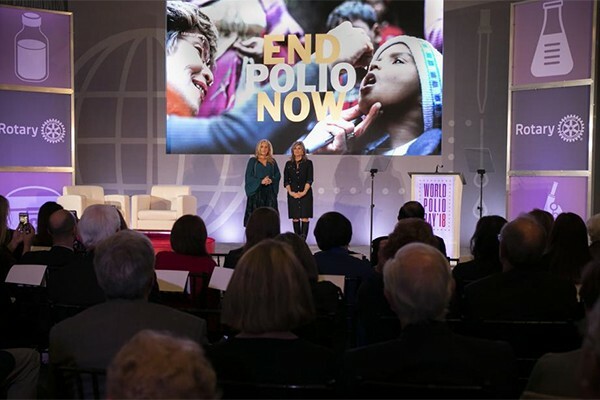 This groundbreaking public-private partnership and its innovative strategies were celebrated Wednesday during Rotary’s 6th annual World Polio Day event, held in Philadelphia, Pennsylvania, USA, at the College of Physicians of Philadelphia. Watch the livestream. Speakers also included award-winning chef, author, and polio survivor Ina Pinkney, who talked about her experience with the disease. Jeffrey Kluger, senior editor at Time magazine, spoke about his recent experience traveling to Nigeria with Rotary to report on polio eradication.